Textbooks and books for libraries are typically Smyth Sewn because they stand up to years of wear and tear. 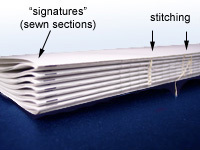 Smyth Sewn bindings use thread to sew through folded signatures of a book. Signatures are made by printing on large sheets and then folding into groups of pages, usually 16 or 24 at a time. Each signature is sewn individually with threads going through each page several times. The threads are then tied off. All of the signatures are likewise attached together with thread creating what is called the book block. The book block is further strengthened using flannel and adhesive on the spine. 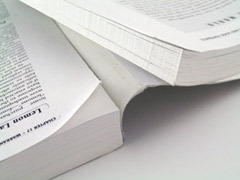 Integrity: Smyth Sewn books are the hallmark of top quality books. For notebook and log book purposes, it is an essential characteristic because they are inherently tamper evident. You cannot remove a page from a book without destroying the integrity of the binding. That is why Smyth Sewn notebooks are required by top research companies for documenting intellectual property for patent filings. Nothing supports a patent claim better than a physical, Smyth Sewn notebook with the inventor's hand written, dated notes with a witness signature. 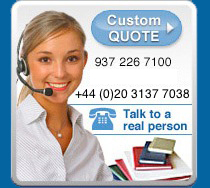 They are also a rock solid method for proving compliance with laws and regulations. 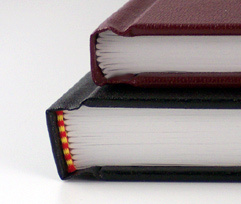 User Friendly: Books with Smyth Sewn bindings lay completely flat, making them easier to read and write in. From lab notebooks for recording intellectual property, to log books for proving regulatory compliance, journals for conferences and sales meetings, and self published books and textbooks, nothing is better suited. Features: Look closely at the binding where the pages meet the spine and you can see the folds of the page signatures. Open the the book to the middle of a signature and you may be able to see the binding thread stitches.